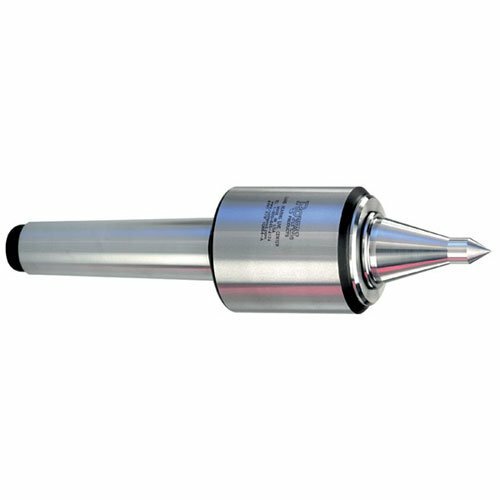 An excellent choice for precision turning, grinding, and hard-turning. Precision, preloaded bearing assembly consisting of three matched angular contact bearings provides exceptional rigidity and accuracy. Low-profile head and extended point combine to offer superior tool clearance. The point extends into the body where it is supported by a needle roller bearing, which further increases rigidity, reduces point deflection, and dampens vibration. Exclusive Roto-Shield coolant slinger and upgraded seal provide outstanding bearing protection for extended operating life. Body and point are hardened and ground for accuracy and durability. Guaranteed accurate to +/-0.00005" TIR or better. 1 year warranty against failure due to manufacturing defects.